Even if you try to choose organic products as often as you can, it's nearly impossible to avoid pesticides altogether. These toxins have leached into our soil, contaminated our water, and coated many of the foods we eat. What's worse is that they can accumulate in our bodies, causing problems ranging from endocrine and nervous system problems to cancer. Fortunately, there's something we can do about it beyond buying organic. But for those we can't avoid, we can flush them out of our system. New research published in the journal Beneficial Microbes has found that the probiotic lactobacilli can actually help reduce our absorption of pesticides by breaking them down. The researchers found that yogurt supplemented with the probiotic Lactobacillus rhamnosus GR-1 helped decrease the bioaccumulation of mercury and arsenic — both dangerous toxins — in pregnant women and children. These bacteria have a number of benefits. These include improving your gastrointestinal state and reducing inflammation. 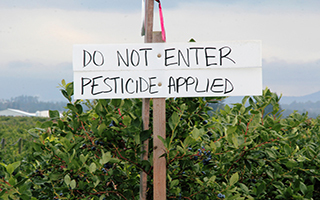 And the researchers are encouraging further studies to determine how else they can help keep us safe from the dangers of pesticides. But don't wait for these studies. If you aren't already taking one, use a probiotic such as Advanced Probiotic Formula intermittently throughout the year and regularly include fermented foods in your diet. You'll find lactobacilli in yogurt, cheese, sauerkraut, and pickles. It can even be found in some animal feeds, so you may be able to help protect your pets as well. You can read the labels to determine what type of bacteria the product uses. In addition, probiotics improve gut health and help resolve and prevent dysbiosis (unhealthy digestive environment that can be responsible for everything from simple indigestion to diarrhea and constipation). If you're thinking about getting even more proactive about detoxifying — consider PectaSol. Taking two or three capsules every night is a scientifically researched, slow, gentle and effective way of removing pesticides and other offensive toxins.